That’s roughly how many times Fitness by the Sea has applied sunscreen to their campers between our Pacific Palisades and Santa Monica beach camps. We’ve been through countless days under the sun, and can proudly say that we’ve had minimal injuries with our campers over the years. And if that weren’t enough, we’ve been referred to as “the safest beach camp I’ve ever seen,” by the chief of Los Angeles County Lifeguards. Below you’ll find the ultimate guide for sun safety for kids. 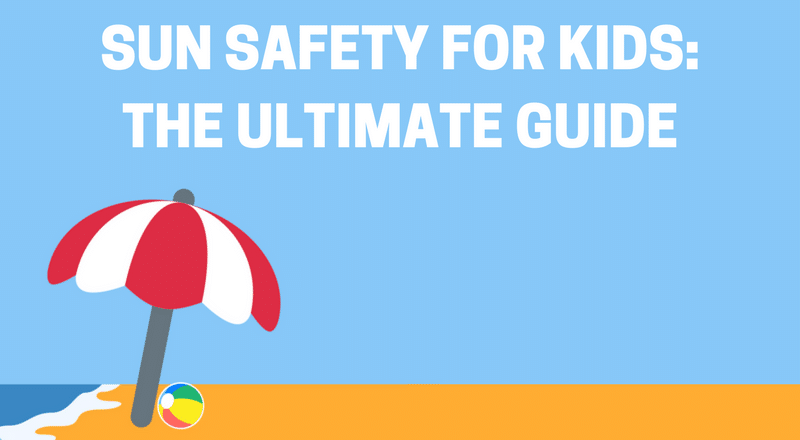 In this guide, we will discuss what you need to know about keeping your kids safe while out in the sun based on our experience running a beachfront summer camp for the last 19 years. Sunscreen 101: What is sunscreen? And why is it important? Yes, you know that sunscreen keeps your family safe from sunburns and protects against skin cancer, but how much do you really know about sunscreen? Before launching into the good stuff, like how to pick a sunscreen, application techniques, and other ways to protect your family from the sun, let’s get a handle on what sunscreen is, how it works, and why it is important. Sunscreens are products that use a variety of ingredients (including chemical and physical blockers) to protect your skin from the damaging UVA and UVB radiation emitted by the sun. By keeping these rays from reaching your skin, sunscreens protect from sunburns, premature aging, and help prevent skin cancer. We know that sunscreen protects our skin from the sun’s harmful rays. But how does it do this? Check out the image down below from Roswell Park for a visual representation. Sunscreens use a combination of organic and inorganic ingredients to protect skin. Common inorganic chemical ingredients used in sunscreen include titanium oxide and zinc oxide, known as physical blockers or mineral sunscreens. These physical sunscreens protect your skin by reflecting or scattering UV rays. Common organic chemical ingredients used in sunscreens include octyl methoxycinnamate or oxybenzone. These chemicals protect your skin by absorbing the radiation from the sun’s rays and then break it down, releasing it as heat. UVA rays make up about 95 percent of the UV radiation that we are exposed to on a daily basis. This UVA radiation causes the photoaging effects of the sun such as wrinkling, sagging, and leathering of the skin. Meanwhile, UVB rays, which are much more intense than UVA rays, are the cause of sunburn and skin reddening from sun exposure. In the past, scientists considered UVB rays to be the main cause of skin cancer. However, now both UVA and UVB rays are recognized as being causes of skin cancer. You’ve probably heard the term SPF a million times, but do you actually know what it means? If you are like most people, probably not! SPF stands for sun protection factor and is an easy way to determine how effective a sunscreen will be at protecting your family’s skin from sunburn. 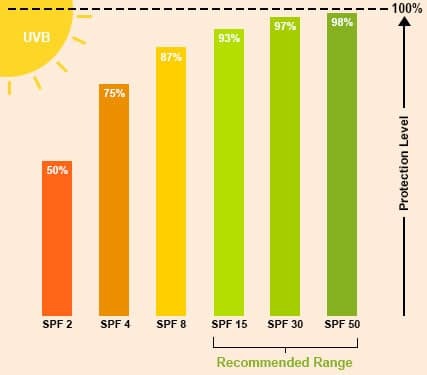 As you can see from the chart above, courtesy of Alyaka, sunscreens with an SPF of 15 or higher block over 90% of UVB rays, and are recommended. 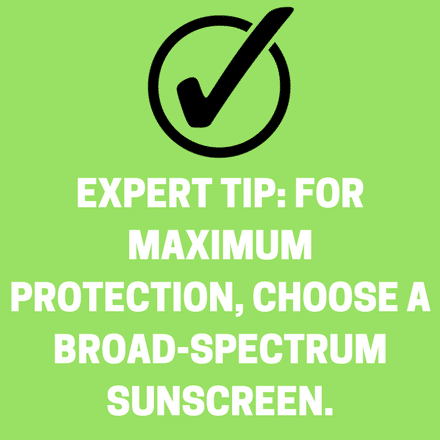 However, it is important to keep in mind that using an SPF above 50 does not provide any additional protection above blocking 98 percent of UVB rays. 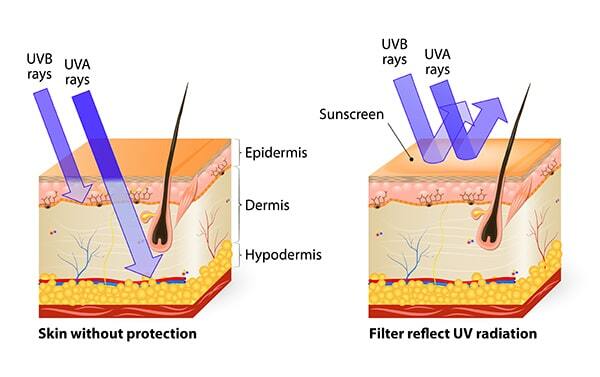 UPF, which stands for ultraviolet protection factor, is used to indicate the level of protection clothing provides from UV rays by indicating what fraction of UV rays can make it through the material to the skin. For example, a rash guard or t-shirt that has a UPF of 50 will allow only 1/50th of UV rays to actually reach your skin. The number one reason that sunscreen is an important part of sun safety for kids is that it is one of the best ways to decrease your family’s risk of developing skin cancer. Aside from preventing skin cancer, sunscreen is also one of the most effective ways you can protect your children from sunburns. In addition to keeping your children safe from the sun, sunscreen also slows down skin aging, keeps redness and blotchiness at bay, and prevents discoloration of the skin. You already know that sunscreen is essential for protecting your child’s skin from sunburns and preventing skin cancer further down the road. However, when it comes to choosing the best sunscreen for your family there are a variety of factors to consider, which can be overwhelming for many parents. Some of these key considerations include finding a formula that blocks both UVA and UVB rays, figuring out which SPF you should opt for (do you really need SPF 100? ), knowing what ingredients to avoid, and deciding between lotions, sprays, wipes, and other delivery methods. In this chapter, we will share what you need to know to choose a sunscreen to effectively protect your family from the sun this season. In our introduction we discussed the difference between UVA and UVB rays, and that both types of radiation can lead to skin cancer. This is why when looking for the best sunscreen for toddlers and children it is key to choose a formula that protects against both UVA and UVB rays of the sun. The SPF label on your sunscreen is only referencing the UVB protection — or protection against sunburn — offered by the product. 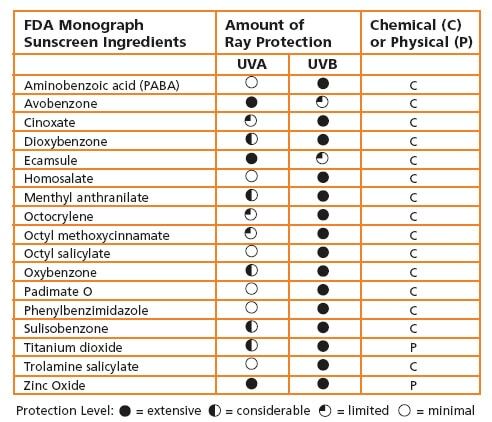 Although UVA rays do not cause sunburns they can cause skin cancer which is why, in addition to looking at the SPF (or UVB protection) on the label of your sunscreen, it is also important to make sure your sunscreen is also broad spectrum, which means it will protect your family’s skin from both UVA and UVB rays. Under new FDA guidelines, sunscreens labeled “broad spectrum SPF” must now pass broad spectrum testing to prove that the product provides UVA protection that is equivalent to its UVB protection. When it comes to SPF, a higher number doesn’t necessarily mean more protection. We suggest opting for a sunscreen that is SPF 30 or 45. SPF 30 sunscreens have been found to protect skin from 97 percent of the sun’s UVB rays, while SPF 45 sunscreens, block about 98 percent of UVB rays. Sunscreens boasting an SPF above 45 do not provide any additional protection from harmful UVB rays. When looking for the safest sunscreen for kids, it is important to know what ingredients work best, and what ingredients may be harmful. Sunscreen labels are typically loaded with big words that can be confusing. However, knowing what to look for can help you easily decode the ingredient list to choose a formula that will safely protect your family from the sun. For chemical sunscreens, we suggest choosing a formula that contains three percent avobenzone. For those that prefer natural mineral sunscreens, look for formulas that list the active ingredient as zinc oxide, in a percentage of 15 or 20 percent. Both zinc oxide and avobenzone have been shown to be the most effective at filtering UVA radiation. Quick tip: keep an eye out for include oxybenzone and octocrylene, which can irritate those with sensitive skin and retinyl palmitate (vitamin A), which is a potential hormone disruptor. With a wide array of sunscreen delivery options available for purchase — including lotions, sprays, gels, foams, sticks, and wipes — it can be hard to decide which formula to choose for your family. In the end, it really comes down to what works best for your specific needs. Below is a brief rundown of the pros and cons of the most popular sunscreen application methods. In our experience, spray sunscreens are the most convenient option for applying sunscreen, especially when kids are eager to get out in the sun as quickly as possible. The main downside of opting for a spray formula is that it can be difficult to tell which areas have been thoroughly covered and which areas still need coverage. Another downside is that the chemicals in spray formulas can irritate children’s lungs. If you do opt for the convenience of spray sunscreens, we recommend you always apply outside to limit inhalation, and be sure to thoroughly cover all areas of the skin (we use a handy diagram to make sure we don’t miss any spots. Get yours down below!). Lotion formulas are recommended for application on large areas of the body like your back, legs, or arms. The main benefit of lotions is that you can see where you are applying them, which ensures a thorough application. However, many children don’t like the stickiness of these formulas, and many parents dislike how difficult they can be to apply in comparison to spray formulas. Stick sunscreens are a great solution for applying sunscreen to smaller areas as well as sensitive areas. We recommend using these handy formulas to apply sunscreen along the hairline, around the eyes, and on the tops of the ears. Stick sunscreens are not ideal for a full-body application or for large areas of the body. Cream sunscreens are ideal for use on the face or on areas of the skin that are extremely dry. Aside from this, cream sunscreens can be a bit heavy for full body coverage. Many people that shy away from sunscreen lotions prefer gels because of their smooth applications. If you are planning to put sunscreen on your child’s scalp, a gel is definitely a much better option than your typical lotion. When discussing sun safety for kids proper application (and reapplication) are two of the most critical topics to understand. Some questions we often hear from parents include how much sunscreen to use, when they should apply it, and how often they should reapply. In this chapter, we share three pro tips from Fitness by the Sea camp owner Eric Colton for properly applying sunscreen. You can rest assured your child is safely protected from the sun and get back to enjoying your day at the beach, pool, or park! 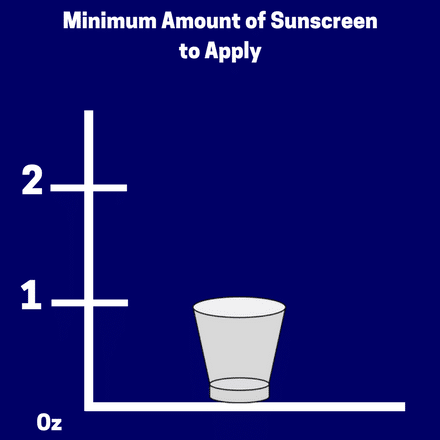 Guidelines from the Skin Cancer Foundation suggest that adults use a minimum of one ounce of sunscreen to effectively protect their skin from the sun’s rays — that’s about a shot glass full. Unfortunately, the organization has not issued specific recommendations for the amount of sunscreen suggested for babies, toddlers, and children. However, in our experience, the key to sun safety for kids is ensuring that all exposed areas are thoroughly coated with a sunscreen that is SPF 30 or 45. And don’t forget to protect areas that are often overlooked such as hands, the tops of the feet, ears, and the back of the knees. For the best sun protection, the Skin Cancer Foundation suggests applying sunscreen 30 minutes before you plan to be in the sun. Applying in advance gives the sunscreen plenty of time to absorb into your skin for the most effective protection from damaging UVA and UVB rays. When discussing sun safety for kids another important factor to keep in mind is reapplying sunscreen frequently. We suggest reapplying sunscreen at least every two hours. If your child is swimming in a pool or playing in the water plan to reapply immediately after they dry off. Also, plan to apply more frequently if your child is sweating. Aside from choosing a broad spectrum sunscreen that is at least SPF 30 and applying (and reapplying) it properly, there are other steps you can take to minimize your child’s sun exposure. Let’s face it, it’s unrealistic to assume you will always be able to stay out of the sun between 10:00 a.m. and 4:00 p.m. Between pool parties, family beach days, sporting events, and other summer fun, your children are going to need to be out in the sun during peak daylight. When this is the case, we suggest trying to find or create shade to block the sun’s rays. This could mean having your picnic under a tree instead of in the middle of the park, playing under a beach umbrella, or even putting up a tent to shield your family from the sun during your next lakeside adventure. At our camps, it means setting up cabanas filled with fun activities to encourage campers to seek shade. This is because clothing can both block and absorb much of the damaging UV radiation we come in contact with. Of course, a variety of factors influence how effective clothing is at protecting against UV rays. 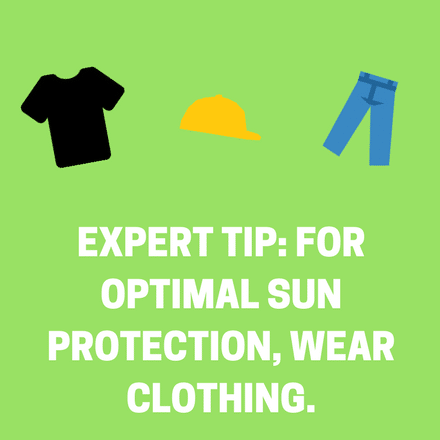 When looking for the clothing that will best protect your children from the sun, stick to fabrics with a tight weave (such as denim), synthetic materials (like rayon or polyester), thick materials (such as corduroy), dark colors, or materials with an ultraviolet protection factor (UPF) label. Sunglasses are more than just a fashion statement, they are also imperative for keeping your children’s sensitive eyes (and the area surrounding the eyes) safe from UV damage. When looking for a pair that will provide adequate protection, choose a pair that will provide 99 percent protection from UVA and UVB Rays, and opt for a style that will cover up as much of the skin around the eye as possible. 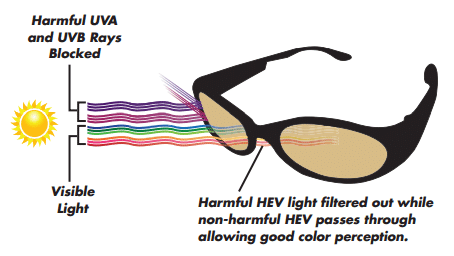 For a visual representation of what sunglasses do for your eyes, check out the Low Vision Doctors of Ohio diagram below. We also recommend choosing styles that are shatter resistant so that you don’t have to worry about your kids participating in sports and games. It may seem pretty obvious, but a hat is one of the best ways to keep kids safe from the sun! A good hat can protect not only the scalp, but also the ears, neck, and face from the sun. We suggest a hat with a wide brim for the best protection, since baseball hats don’t protect the neck and ears from the sun. Unfortunately, sunburns happen to the best of us. Even when being vigilant about sunscreen application and staying in the shade, most parents will find themselves dealing with a sunburned child at one point or another. 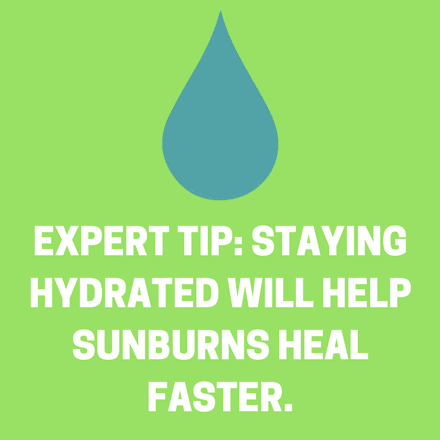 Fortunately, there are many ways to ease the pain and discomfort of a sunburn and increase healing time. Below we will discuss some of the tips and tricks that we have learned for treating sunburns over the years. Tip 1: Get out of the sun! As soon as you notice your child’s skin turning pink or red it is time to get out of the sun immediately before more damage is done. If you absolutely cannot leave the pool or beach, seek a shaded area, and if possible get indoors as soon as possible. 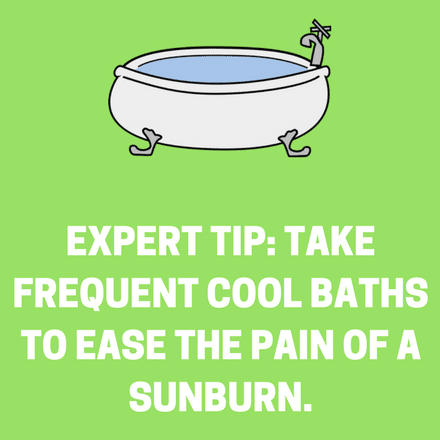 The American Academy of Dermatology Association (AAD) suggests cooling your children down with frequent cool showers or baths to help ease the discomfort of a sunburn. After a shower or bath, they suggest lightly patting the burned areas dry and immediately applying lotion to seal in moisture. The AAD suggests sticking to moisturizers that contain aloe or soy, which will soothe your child’s irritated skin. They also recommend using a hydrocortisone cream for areas that are extra inflamed or irritated. If your child is in a lot of pain or discomfort from their sunburn you can also have them take a nonsteroidal anti-inflammatory drug (NSAID) like naproxen, aspirin, or ibuprofen to reduce inflammation, swelling, and discomfort. When your child has a sunburn they can easily become dehydrated since the burn will draw fluids to the surface of your child’s skin. 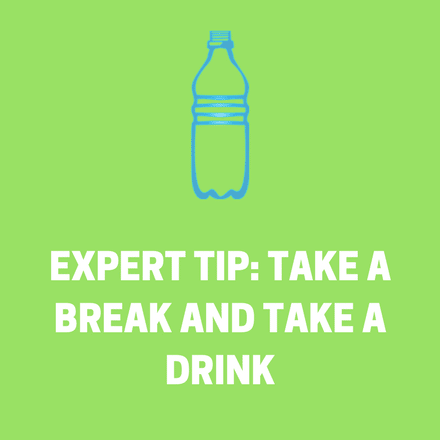 For this reason, it is important to ensure your child drinks plenty of liquids to keep from becoming dehydrated during the healing process. If your child’s sunburn begins to blister, they most likely are suffering from a second-degree sunburn. It is important to let these blisters heal by not letting your child pop or pick at the blistered area. Although most sunburns will heal on their own with time, it is important to know when to seek medical care. In instances where your child is experiencing severe blistering or suffering from chills, fever, dizziness, or nausea, you should pay a visit to the doctor, as they may be suffering from sun poisoning. 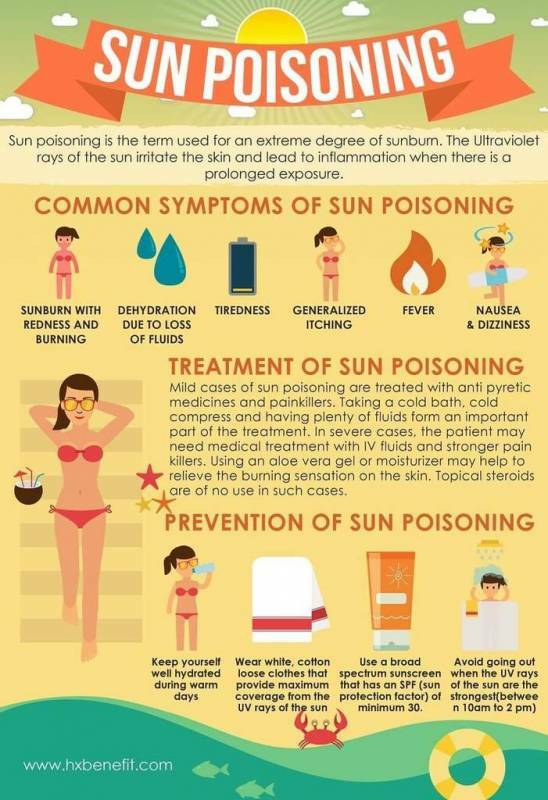 For more information on sun poisoning, check out this handy infographic from HXBenefit down below. After nineteen years of running our beachfront summer camp for kids, we consider ourselves to be experts on sun safety for kids. In fact, we calculated that between our approximately 420 campers attending our four camps over 12 weeks annually, with three sunscreen applications a day, we apply sunscreen approximately 25,000 times each season! In this chapter, we share our unique approach to sun safety including application tips, sunscreen recommendations, and other tips for keeping kids safe while they have a blast in the sun. 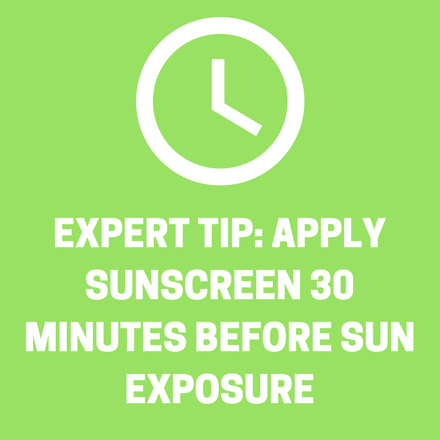 We apply sunscreen (at least) three times a day – no excuses! One of the most frequently asked questions that we receive from parents is how we keep campers safe from the sun during our beachfront summer camps. As parents ourselves, we consider sun safety for kids to be one of our top priorities. This is why we require campers to have sunscreen applied three times a day with SPF 45 sunscreen. We request parents liberally apply sunscreen to their children before dropping them off in the morning. However, we are careful to double check this has been done as each camper is dropped off. If it has not been done, a member of our well-trained staff will ensure sunscreen is properly applied. Our second sunscreen application of the day occurs before lunchtime when we require campers to reapply sunscreen with the assistance of counselors before eating lunch. We also have a third mandatory sunscreen check in the afternoon — which we especially emphasize for campers participating in our wide variety of water activities — since being in the water makes campers more vulnerable to burning. Since we want to ensure all of our campers (and staff) are thoroughly protected from the sun’s damaging rays, we stick to SPF 45 spray from Banana Boat, which we have found to be one of the best sunscreens for toddlers and children, for fast and continuous reapplication to the entire body. We also equip all new staff members with a handy diagram that details the best methods for applying sunscreen. We also protect campers from the sun by providing large (10 foot by 10 foot) cabanas filled with fun and exciting activities at all four of our camp locations. We know your kids won’t want to miss out on a minute of fun by sitting quietly under a cabana, which is why we make sure that our shaded areas are anything but boring by providing a variety of entertaining activities for kids to participate in. Some of these include puppets shows, magic tricks, arts and crafts, face painting, henna tattoos, and more! By encouraging kids to participate in some of these shaded activities we greatly limit their sun exposure. Another key component of sun safety for kids is ensuring our campers stay hydrated as they enjoy hours of fun on the beaches of Southern California. Aside from regularly reapplying sunscreen, encouraging campers to play in the shade, and reminding campers to hydrate throughout the day, we also have camp t-shirts, hats, and rash guards for added sun protection. Our rash guards are provided by Aleeda and incorporate UPF, which keep campers safe from sunburns when participating in water activities. From our years of experience running Fitness by the Sea and raising our own children on the sunny coast of Southern California, we know how important sun safety is — not only for preventing sunburns but also for protecting your family from skin cancer and sun damage. However, we don’t let the sun get in the way of our summer fun, and neither should you! Instead, by understanding how sunscreen works, knowing what to look for in a sunscreen, practicing effective application (and reapplication) methods, utilizing other sun protection measures, and knowing what to do in the event of a sunburn, you can maximize your family’s fun in the sun this summer without endangering their health. We hope this guide has shed some light (pun intended!) on the best ways to protect your family from the sun, so that you can get out there and have a blast this season, knowing that your family is safe from the sun’s harmful rays.